6 drops Tea Tree Oil – Great for itchy or dry flaky scalp and acts as a preservative for the cream. OPTIONAL: 1 1/2 cup Eco Styler (Whichever color Eco styler is fine ) or Aloe vera gel – for extra definition of twists and braid outs. 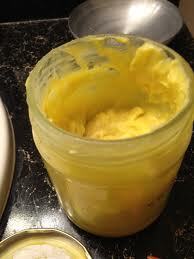 • In a bowl soften shea butter and cocoa butter ( about 30-45 seconds ) in a microwave. • Add all the other ingredients in the bowl and wisk or blend in a blender. You should have a fluffy consistency. Store in a empty jar with a lid. Let it stand for a few minutes to cool and it’s ready for use. Let me know how it turned out for you in the comments below.